Chikuwabu (ち く わ ぶ?) Is a wheat-based Japanese food that is generally eaten as one of the stuffing inside oden. Similar to the udon-making process, the dough is made by kneading the flour with salt and water and then formed into a thick cylinder with an empty cavity in the middle and then steamed. Chikuwabu is well known as the oden stuffing in Tokyo, but they can still be found all over Japan in supermarkets and specialty stores. Chikuwabu is often misidentified as a fish-based chikuwa, because they have similar shapes and names and both are also common in oden. 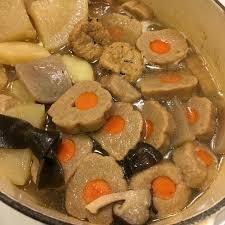 However, unlike chikuwa, chikuwabu is rarely eaten without oden.